The temperature pulsations arising in coolant flow at the entry into FA are examined from the standpoint of the possibility of their diagnostics by thermocouples of the protective-tube block are examined. It is shown that the temperature pulsations remain in the FA and can be recorded at the exit from FA by means of the in-reactor monitoring system. 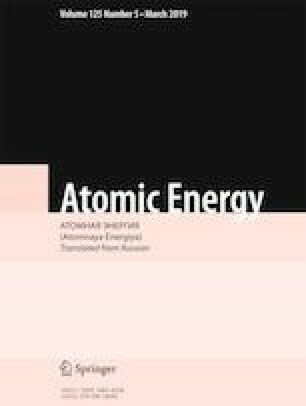 The aim of this work is to call the attention of specialists working in the field of temperature diagnostics of nuclear power facilities to the application of the elements of the theory of generalized functions, specifically, the fundamental solutions of heat-conduction operators and the methods of integral transformations of generalized functions, which are powerful means for solving applied problems of the temperature diagnostics of NPF in order to increase their operational safety. Translated from Atomnaya Énergiya, Vol. 125, No. 5, pp, 263–265, November, 2018.